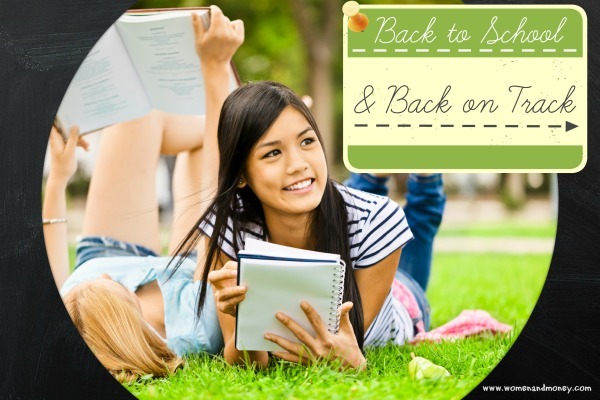 Back To School Back on Track - Women and Money Inc.
It’s that time of year again… back to school. With the kids returning to school and the fresh crisp air of fall, back to school season brings such a feeling of fresh beginnings as much as the new year in January. Many of us have grown tired of the lazy, laid back days of summer and are ready for a bit more structure and achievement, whether that’s organization, routine, or growth. If you’re looking to organize your money and get it working for you, check out our free printables and editables: budget worksheet, spending tracker and debt tracker. We designed them to help you take control of your money and achieve your financial goals. If you have kids, you need to read the 10 Surprising Kid Expenses that Sabotage Your Budget, many of these expenses are school related and with back to school upon us they will be coming up quickly! Organizing and refreshing our homes is another popular goal for the fall season, but you can save money by following our 9 tips on How to Save Money on Home Decor. And if you’ll be refreshing your wardrobe for fall/winter, check out our 20 Ways to Save Money on Clothes for a lot of great tips! Another thing to think about this time of year is budgeting for Christmas. Have you been putting money aside each month since January? Or are you still paying off the credit card bills from last Christmas? Avoid the debt hangover and the stress of how to pay for everything by being prepared this year. Start now by making your list, doing a budget, looking for bargains and working on homemade gifts if you would like to give them. There’s some good toy clearance sales on right now, before the new shipment of Holiday season toys arrive, so keep your eye out for that. And take advantage of back to school deals on electronics, home goods and more to stock up on Christmas presents (after you know who you’re buying for, what to buy and how much to spend). As for me, I’m ready to embrace the season of pumpkin desserts, crunchy leaves and warm sweaters, while getting back to the routine that keeps the gears working and moving towards my goals. This entry was posted in Blog, Budgeting, Women and Money. Bookmark the permalink. Both comments and trackbacks are currently closed.